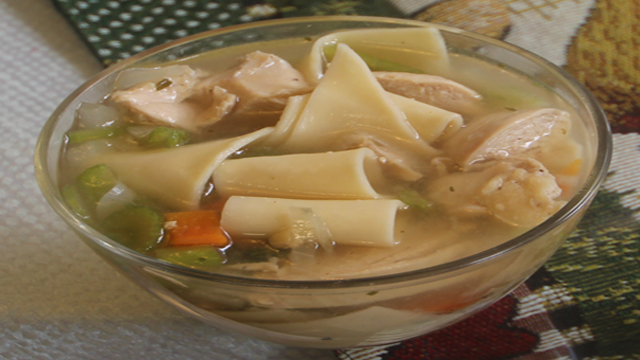 Classic Chicken Noodle Soup Recipe recipe for homemade Chicken Noodle Soup is one of the most comforting foods you can cook for your family. 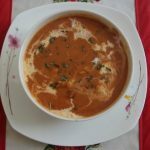 It’s also a great way to cook a healthy dish that if you are a beginner cook or chef to be you should know how to make. Some call this Chicken Noodle Soup Jewish Penicillin. I love soup and my Chicken Noodle Soup is a world class recipe. Rich soup like Chicken Noodle Soup is a great dinner on a cold night served with fresh bread, and this is a stand out meal. Let the Bald Chef show you step by step how to make some incredibly tasty homemade soup. This recipe features Chicken Breasts and Artisan Egg noodles. Let’s make some chicken noodle soup from scratch. This how to Cook the Bald Chef’s Famous Chicken Noodle soup first in a large Stock Pot pour in 32 Oz Chicken Stock , 1 1/2 cups water, and 4 Garlic Cloves minced bring to a boil. Next step is to place 2 Pounds of Chicken Breasts into the boiling stock. Cook for 20 min minutes when the chicken is cooked remove from the pot and let it cool. Add the 16 oz Wide Dutch Egg Noodles and cook until done ,remove and cool the noodles. De bone the Chicken breasts and cut into cubes of 3/4 inch. Add the Chicken, onions, carrots, and cellery seed, salt, black pepper, to the stock pot. Cook the chicken soup for 5 more minutes. In a bowl place the cooked Dutch noodles and add the chicken soup top with fresh parsley. Now sit back and enjoy your homemade classic Chicken Noodle Soup. I have a little twist with my chicken soup I do on occasions. Since I make a big pot I add a half to one cup of white wine. I use a good chardonnay with mine. Like you I also keep my noodles separate. I don’t care for soggy noodles either. Let me know Glen what you think or if you tried adding white wine to your chicken noodle soup. I am very thankful you have a passion of cooking like I do and thank for sharing your recipes with everyone. “Hey Bald Chef- I m a bald chef too!! Wonderful chicken noodle soup ! Looks delicious Glen. A classic that’s perfect for this cold weather we are having! Thanks for sharing, Glen!